Nathan Schneider in What Happens when God is Biologized? valiantly pulls together the threads under three heads: cognitivists, neurotheologians and evolutionary biologists. Brings to mind Sir Alistair Hardy’s The Biology of God, based on Hardy’s hypothesis that religious experience involves a kind of awareness that has evolved through natural selection because of its survival value to the individual. Think of individuals or groups of believers who have gone to their deaths for their beliefs. It is not the simple fact of belief in a God that they have died for but the complex and sophisticated religion belief in God was part of. Believing in the face of death is to me as much about the strength of the in-group drive than the beliefs died for. Or, in other words, the tendency and capacity to belief would not work very well without group support. It is a double bind. To recant in the face of death (though in the holocaust it would have made no difference – they thought they were destroying a race as much as a religion) is to make it harder for the remainder of the group who survive to adhere to the belief they hold in common. Though the given reasons will be their faith, they cannot not have the idea of what comes after for the survivors if they are seen to recant under duress. Any study of religions soon turns up the thorny issue of schism. In the article is a quote from Cognitivist and Christian Justin Barrett, author of Why Would Anyone Believe in God? I was struck by how patently silly this was, in the sense that a prodigious effort over millenia has been made to promulgate both the idea of God, of God over over Gods (at one time most peoples were polytheistic) and of the desirability and efficacy of one religion over another; while at the same time minds have been at work for centuries refuting God’s existence within the framework of new philosophical thinking and scientific advance. Both belief and non-belief require effort, topping up, in various ways. One of these is the support of others who believe or disbelieve like you. A study of the history and sociology of religion will make it clear how proactive a process belief is, and how much it is a group activity. How over time there have been shifts in emphasis, which is not unlike an evolutionary process, except that human thought in the main is deemed to be progressive, while evolution is blind. The mountains of time theologians have spent on the proofs of God’s existence is just one part of effort to maintain belief in God. I have long believed (or should I say’ had the opinion that’) the core to understanding belief, religions and ideologies is through the psychology of the in-group. This is because the in-group tendency is surely biological whether or not the tendency and capacity to believe are. Beliefs are taken to be the exemplar of persistence, but people have died (in both the sense of being adherents and non adherents) for political ideologies too. We have no way of telling (no control experiment) if belief in God comes naturally, and persists, because people grew up in societies which were and are God saturated. A natural experiment would be where a believer has been left isolated for years, of which there must have been a few. Or where individuals who were not believers were left on their own. Auschwitz was a natural experiment: Where is God now? Basic atheism is not a belief. It is the lack of belief. There is a difference between believing there is no god and not believing there is a god — both are atheistic, though popular usage has ignored the latter. I am a bit confused here: are not the statements”I believe in God” and “I don’t believe in God” both beliefs? Need to turn to philosopy : Stanford Encyclopedia of Philosophy: belief. Organisms do not simply adapt to previously existing, autonomous environments: they create destroy, modify and internally transform aspects of the external world by their own life activities to make this environment. Just as there is no organism without environment, so their is no environment without an organism. He then goes on in a fascinating footnote, to take apart the logic of Richard Dawkins’ The Extended Phenotype, in which NIOG says Dawkins is forced to handle the fact that the organism acts on its environment by defining what we here call the “active environment” as an aspect of the organism’s phenotype. Dawkins responded strongly to Not in Our Genes at the time of publication, e.g in New Scientist. Maybe some of Lewontin’s arguments about the ifs buts and whyfors of explaining biology, such as the organism-environment question, could be transferred to examining belief. Then there is the business of believing in a different kind of God to the majority. For example, the Cathars were ‘written out of’ history’ because their way of expressing their belief in God was different from the established Catholic church. 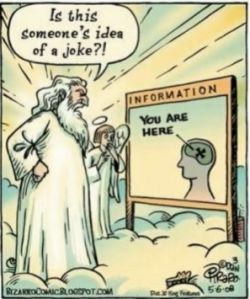 Belief in God is not just a private thought or public assertion: it involves a demonstration in personal terms (usually held in common) through religious practices. In one way of looking at it, we might say that science may be beginning to show some sort of spiritual feeling exists (evolved) in the mind of man, but that it took the organised thinking of many men to explain what it was we were feeling. It is always possible for an individual to claim a feeling means something or other: a transcendent or immanent sensation MEANS the presence of God; The feeling you get is interpreted as being in the presence of The Almighty. Tradition and social conditioning help to make it so. Strictly, the appurtenances of faith – the rules and regs that underpin it – are not faith itself: the dogma and accepted theology of a particular church, at a given time, are not the beliefs of individual people in an omnipresent all powerful God. They are add ons. There have been different add-ons at different times. One might say that religion (organised religion) has been build around the spiritual feelings which people claim to experience. In other words, people come to a decision about what this vaguer feeling is about or points towards. The choice of what the experience is deemed to be has varied over time. Ancient peoples were not monotheistic. They would have been unlikely to focus on a single God if they believed in many. Does the argument that would be used to justify the change from polytheism to monotheism –that people didn’t understand correctly there was only one God till a certain time in history — mean that the God spot only evolved quite recently? It has been suggested that in neolithic times sacred practices were often much closer to natural phenomena. In other words with the passage of time they have moved into the supernatural. * Both Lewontin and Rose are Left-wing, so take it or leave it.